Owners of recent Lumia smartphones that have just 512MB of memory might not get a full-featured, smartphone version of Windows 10. Microsoft is working on Windows 10 for smartphones with limited memory, including the popular Lumia 520, the company’s Joe Belfiore said on Twitter on Sunday. The goal is to make the OS available for these devices, but features may vary, he added without offering more details. This echoes a recent statement made on Microsoft's Lumia Conversations blog. In addition to the Lumia 520, last year’s Lumia 530, 630 and 635 (pictured at top) all have 512MB. These lower-cost Lumias are among the most popular Windows Phones, especially the Lumia 520, according to AdDuplex statistics. To develop inexpensive smartphones, companies must make hard choices, but the lack of memory on these Lumia models may have been shortsighted. The Lumia 530, 630 and 635 shipped at a time when 1GB of RAM was standard on similarly priced or even less expensive Android-based smartphones. Thus, owners of these smartphones can’t be blamed for feeling ticked off at Nokia if they get a lightweight version of Windows 10. Nokia could have easily made the lack of RAM a non-issue by spending a bit more. Microsoft’s acquisition of Nokia was finalized at the end of April. 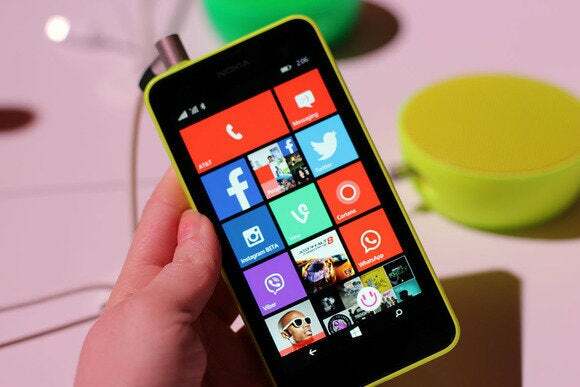 The Lumia 530 was announced in July, but the features and specs were likely decided on long before that. Budget-priced Windows smartphones launched by Microsoft recently, including the Lumia 435 and 535, have 1GB of RAM. When Microsoft demonstrated the smartphone version of Windows 10 last month, it said the goal was for the majority of Lumia phones running Windows Phone 8 and 8.1 to be upgraded. It singled out models such as the Lumia 435, the 735, and the high-end 930. Windows 10 will feature notifications that stay in sync across smartphones and PCs, as well as more full-featured versions of Office apps and a new version of Cortana. Microsoft plans to make a preview version of Windows 10 for smartphones available this month, according to Belfiore.